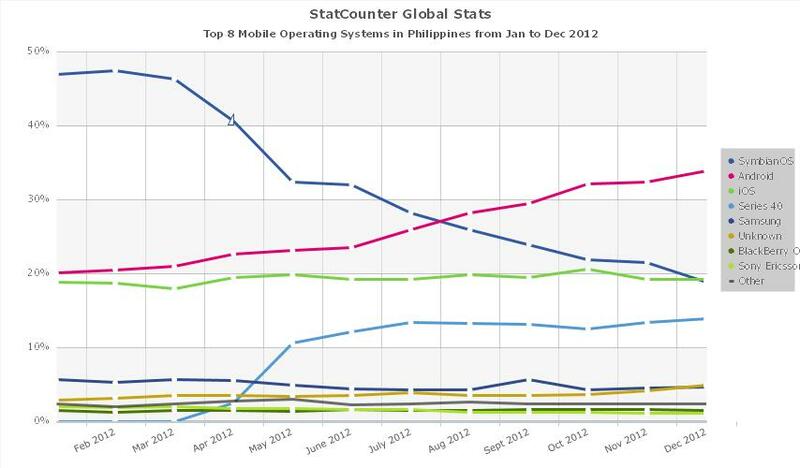 Statcounter measures mobile operating system usage. This figure does not represent the number of phone sold, but rather the number of page hits per type of operating system. 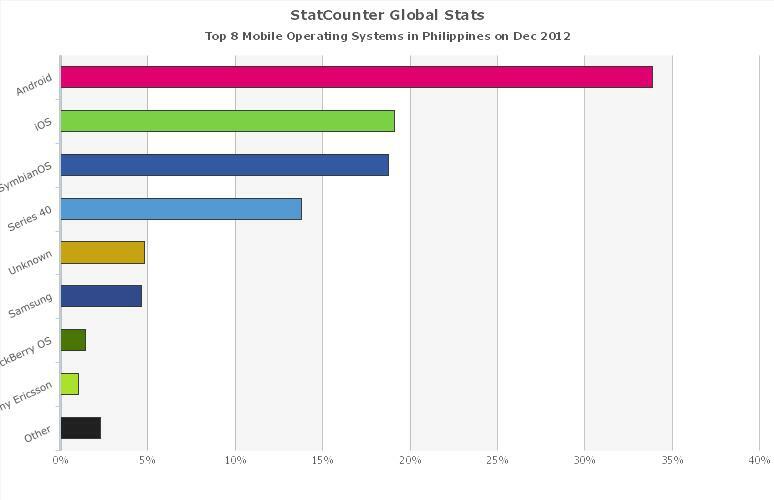 For December 2012, Apple iOS became the second most used mobile operating system in the Philippines on sites monitored by Statcounter, at 19%, going past Symbian OS for the first time. 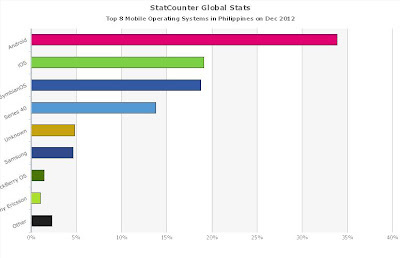 If you count both Symbian OS and Symbian 40 usage Nokia's operating systems still account of 32.6%. 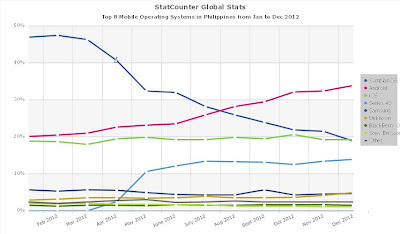 The top mobile operating system in the Philippine is Android, which now has gone past both the combined Symbian OS and Symbian 40 usage at 33.9%. Looking at the figures for 2012, the trend is clear with Android usage increasing by 60% in the last 12 months, while Symbian OS usage has dropped by about the percentage over the past 12 months. Symbian 40 usage is stable. Apple iOS has usage has been steady for the past 12 months. With the Symbian OS phone released in the past two years, and Symbian 40 phones, being lower end devices, it is likely that majority of the remaining 32.6% will be absorbed by Android over the next two years. thanks mga bothers its me newer, thanks for giving me one of the member of this organazation,i hope i can give or giving me more ifo about all mobile phones. HTC Butterfly - Samsung Galaxy S III Killer? Cheaper version of the iPhone 5? Apple iPhone mini - Really now?